Seemorerocks: "Owning the Weather in 2025"
"Owning the Weather in 2025"
Sometimes you see thing that stop you in your tracks. In 2025, US aerospace forces can 'own the weather' by capitalizing on emerging technologies and focusing development of those technologies to war fighting applications. Such a capability offers the war fighter tools to shape the battlespace in ways never before possible. While some segments of society will always be reluctant to examine controversial issues such as weather modification, the tremendous military capabilities that could result from this field are ignored at our own peril. From enhancing friendly operations or disrupting those of the enemy via small scale tailoring of natural weather patterns to complete dominance of global communications and counterspace control, weather modification offers the war fighter a wide range of possible options to defeat or coerce an adversary. 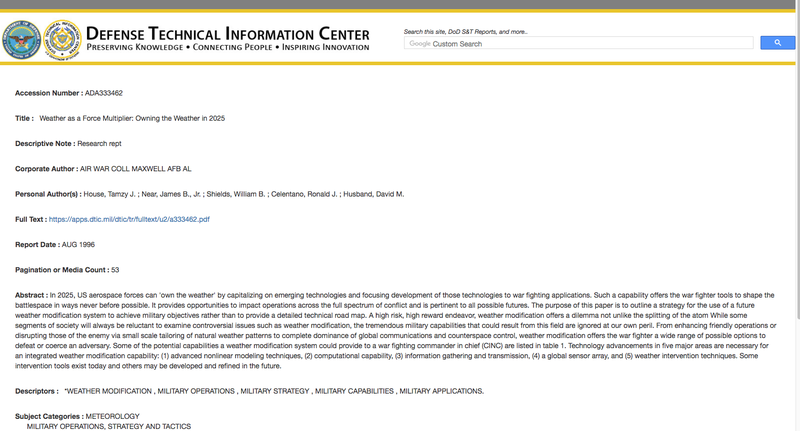 Some of the potential capabilities a weather modification system could provide to a war fighting commander in chief (CINC) are listed in table 1. Technology advancements in five major areas are necessary for an integrated weather modification capability: (1) advanced nonlinear modeling techniques, (2) computational capability, (3) information gathering and transmission, (4) a global sensor array, and (5) weather intervention techniques. Some intervention tools exist today and others may be developed and refined in the future.